The attempt to tarnish my name, paint me as a common criminal and convict me of wrongdoing in the court of public opinion without even hearing my side of the story is petty, shameful and nauseating. “The truth is like a lion. You don’t have to defend it. Let it lose and it will defend itself” – St. Augustine. For the last few weeks I have been the subject of absurd and outlandish headline stories in various newspapers that have accused me of being a fraudster and that have claimed that funds were transferred into my bank account by the former National Security Advisor, Col. Sambo Dasuki and by the Governor of the Central Bank Bank of Nigeria. They have also claimed that I used public funds for the Presidential campaign of President Goodluck Jonathan. It is also a reflection of the desperation of those who seek to pull me down and destroy me simply because my opposition to this government has been unrelenting. In January 2015, I was appointed as the Director of Media and Publicity for the Jonathan/Sambo Presidential Campaign Organisation by President Goodluck Jonathan. The Director-General of the Campaign Organisation was Senator Ahmadu Alli and the Deputy Director-Generals were Alhaji Ibrahim Turaki SAN (North) and Governor Peter Obi (South). Chief Tony Anenih, an elderstatesman and one of the most distinguished and reverred leaders in our country, was the Presidential Advisor to the Campaign Organisation. There were at least 10 other Directors and Directorates apart from me and mine including the Directorate of Mobilisation, which was led by the respected Professor Jerry Gana and the Directorate of Administration which was led by Alhaji Aliyu Modibbo. There were also zonal and state Directors of the Presidential Campaign Organisation in all the zones and states of the country. All these names that I have mentioned including all the other Directors whose names I have not mentioned are, as far as I am aware, men and women of immense integrity and good character and they have mostly been either ministers of the Federal Republic or state governors at one time or the other in our history. It was an honour to serve alongside such people and I have absolutely no regrets in doing so. Yet given the fact that I was not the only Director in the Campaign Organisation and in view of the fact that all the Directors and zonal and state Directors got their funds from the same source and account as I did, one wonders why only I and three others should be singled out for this reprehensible treatment and these false allegations? I chose to remain silent on the issue up until now simply because the allegations have not been officially made by the Economic and Financial Crimes Commission (EFCC) or anyone else, but the newspapers keep citing sources “inside the EFCC” as their basis for these shameful allegations. Mr. Josef Goebbels, Chancellor Adolf Hitler’s Information Minister when Germany was in the terrible grip of the Nazi party, said that once a lie is repeated enough times it becomes truth to those who are continuously subjected to it. This is especially so if it goes unchallenged. I cannot sit by silently as my name is dragged through the mud in this way and I am convicted in the court of public opinion. This happened to me once and it took seven years to clear my name. It will not happen to me again. Consequently I am constrained to take this opportunity to state the facts of this matter, set the record straight and await my traducers and accusers to make their next move. It is indeed time to challenge those who are making these allegations and to kill the lie. The fact that my bank account was frozen on the orders of the EFCC two weeks ago without any explanation is proof of the fact that I am being targetted and that those who seek to have their wicked way with me are about to pounce. Given this, it is important that all the relevant facts are put before the world before I am subjected to the Dasuki treatment – put away indefinately and not given the opportunity to defend myself before the public. Meanwhile, in their usual manner, after this is done, the EFCC will then flood the media with all manners of lies about my so-called atrocities which only exist as figments of their imagination. The allegations of fraud and the receipt of public funds from the National Security Adviser’s Office and the Central Bank into my bank account are false. These allegations are baseless, wicked, shameful and irresponsible. It is not true that ANY money was paid into my account by or from the National Security Adviser’s Office, the Central Bank of Nigeria or any other government agency or institution last year or at any other time. As the Director of Media and Publicity of the Jonathan Presidential Campaign Organisation, I was asked to submit a budget for my Directorate by Chief Tony Anenih, the Presidential Adviser to the Presidential Campaign Organisation and Mrs. Nenadi Usman, the Director of Finance. My team and I prepared a budget and it was approved. Rather than collect cash, for security reasons and the purposes of accountability, I was advised by the Director of Finance to open a bank account for the task ahead then, which I did. The funds were paid into that account in installments at the beginning of last year by the Director of Finance and each deposit was authorised and approved by the Presidential Adviser to the PCO, Chief Tony Anenih. The account through which I was transferred money was a private company account which was owned by or under the control of the Director of Finance. It was the same company and account that was used to send money to all the other Directors of the PCO and the Zonal Directors, State Directors and all our PDP governorship and legislative candidates during the various campaigns. I made a point of asking what the source of the funds in this account were and I was told by the Director of Finance that the funds were sourced from private individuals and private companies who opted to support and fund President Jonathan’s campaign. She told me that no money was paid into her company from any government official, account or agency. This she told me in the presence of witnesses and I believed her. I was told that there was a fundraising event held by our party (PDP) which took place in early January 2015 in which billions of naira was raised specifically for the Presidential campaign. I believed this to be true and I had no reason to doubt it. Our funds were given to us by the president who was the leader of our party through the Director of Finance of the PCO and we were not in a position to inquire into the sources of funding of the party’s campaign. Indeed, it was not our responsibility to do so. Once I got these clarifications and confirmation, I agreed to receive the funds into the said bank account and use these for their stated purpose. The transfers were made and I used the funds to carry out all our operations during the course of the presidential campaign. It was an aggressive and well-run campaign and we gave our opponents a very hard time indeed. It was also very expensive and we barely had the resources that we really needed but we did an effective job with the little we were given. The whole nation, including our friends and our enemies, can bear witness to that and they saw the excellent quality of our work. Hardly can anyone dispute this, yet some fail to appreciate the fact that such a strong showing costs a lot of money. Media and publicity campaigns cannot be run on goodwill alone: you need cash, and plenty of it. During the course of the election and after its conclusion, I submitted detailed accounts of our expenses and evidence of our work to the Director of Finance of the PCO for onward transmission to the Director-General of the PCO and ultimately President Jonathan himself about how the money was spent and they were satisfied. Given the fact that these were not public funds, the only legal person that can inquire into our expenditure of campaign funds is President Goodluck Jonathan who set up the PCO. I was commended for my efforts by him and I can proudly say that my Directorate did not owe any individual, service provider, organisation or media outfit that provided any services to us one kobo at the close of the campaign. All our debts were paid and obligations met during and just after the election. The suggestion that there was any fraud in any of this or that I colluded and conspired with others to use government money to run a campaign is false and very insulting. The suggestion that the money was some kind of “cash bonanza” or “bazaar” as has been reported by the leading pro-government newspaper in the country today is childish and absurd. If that had been the case, I doubt that I would have been foolish enough to open a bank account to receive government funds or “bazaar funds” as this would have been easily traced. If I had anything to hide or if I was doing anything wrong I would have insisted on collecting cash for my operations which would have been far easier to conceal. The fact that the EFCC gained access to my bank account and leaked details of it to the media including my inflows is not only a gross violation of my privacy but it is also unlawful. I was a minister of the Federal Republic of Nigeria ten years ago and I was a key official in the Presidency thirteen years ago. I had the honour and privilage of serving my country in these two capacities when the father of our nation, Chief Olusegun Obasanjo, was our president. Consequently I am familiar with the workings and importance of accountability, due diligence and due process. This is why I was very careful with how we managed our resources at the Directorate and why I appointed a seasoned civil servant, who retired from the civil service with commendation at the Director level, as my Director of Finance in my Directorate. I was also mindful of the fact that I had to be very careful with the management of funds that were put under my care given the fact that I had been wrongly accused and viciously persecuted by the Yar’Adua administration and the Farida Waziri-led EFCC through trumped up and baseless criminal charges for the previous seven years. That whole ordeal almost ruined my life and career but God was with me throughout and He delivered me from their evil because I had done nothing wrong. On July 1st 2015, I was acquitted by a duly constituted court of law of all those charges and I give God the glory for that. Yet the struggle continues. I am appalled at the behaviour of the EFCC in this latest matter but I am not surprised because they have had it in for me for many years. Their almost obsessive interest in me and their motivation to destroy me is essentially political and partly personal and this has always been so. In short, just as was the case seven years ago, they are being used by the powers that be and by forces that are far above them. To that extent I sympathise with them. Yet, if this is an attempt to intimidate, silence or distract me they shall fail because I am not a coward and I do not fear them or those that sent them to torment me. And neither will I sit by idly and watch them trying to destroy me again. Their allegations are malicious and self-serving and there is no substance or truth in them. We did not run the Presidential Campaign Organisation or my Directorate with paper or hot air: we ran them with money. There is no crime in that. A substantial portion of that money was paid by my Directorate directly to the media for rallies, television, radio and newspaper adverts and jingles, together with many other services rendered and we have all the records and documents to prove it. As stated earlier, those records have been duly submitted to the relevant quarters and they commended us for our work. I did not run the Directorate alone and I had at least 10 Deputy Directors, Assistant Directors and Sub-Directors, who were all also appointed by President Jonathan, working under me. I was responsible for the funding of each and every one of their various operations. Our entire team was dedicated and we all worked very hard because we believed passionately in our candidate and our party. I have yet to hear of any Presidential Campaign Organisation anywhere in the world that was run without any money and that was funded with just goodwill. I might add that we spent far less money than the APC and the Buhari Presidential Campaign Organisation because they had access to massive amounts of state government funds and they used those funds effectively. For every million naira we spent, they spent ten. They even contracted the services of a famous American media consultant (the same one that President Obama used in 2008) and paid him ten million U.S. dollars for his counsel and advice. They had fleets of cars and buses whilst my Directorate was not even given one vehicle to get our people around. The official SUV that was meant to have been given to us for our operations during the campaign was hijacked and it never arrived. We were forced to use our personal vehicles and we were glad to do so. Yet the other side had everything that money could buy. They even chartered numerous private jets throughout the campaign to get around the country. Where did they get all their funding from? Why is the EFCC not leaking stories or talking about that? Instead of using the EFCC to try to rubbish me and my colleagues and smear our good names, those that are in power today should tell us where they got their campaign funds from and how much of it came from the governments of Lagos and Rivers States. The two people that headed those two state governments then are now both Federal Ministers today. One of them, who was the Director-General of the Buhari Campaign Organisation, was specifically indicted by a Judicial Commission of Inquiry for using millions of dollars of state government funds to run the Buhari campaign, yet nothing has happened and his reward has been to be appointed as a minister. Again, what about the five billion naira cash that was flown down to Port Harcourt in Rivers state from Abuja in a chartered plane a couple of days before the re-run election that took place on March 19th, 2016? Where did they get that amount of cash from and what was its purpose and source? What has the EFCC said or leaked about that? It appears that there is one law for those who are in power today and another for those that are not. Why persecute the innocent and leave the guilty? Was it a crime to fight and lose an election? If Jonathan had not been a gentleman and had insisted on remaining in power at all costs or challenging the outcome of the election in court, would we have the peace that we are enjoying in our country today? Have those who are behind all these nonsense forgotten all that so soon or is it that they are just drunk with power and they are on a mission of revenge? If that is the case are they then worthy of the power that God has given them and should He not take it away from them before it is too late and they set the country on fire? If there was any wrongdoing, can the EFCC honestly put their hands on their chest and say that those of us that were asked to do a job and given money to do that job knew anything about it? Were we the ones that sourced the funds and were we expected to launch our own private investigation into where the funds came from before accepting to receive and use them for the job we were asked to do? In their heart of hearts they know that the answer to the two questions are both in the negative. Instead of going after the right people, they wish to use the situation to embarrass and shame those of us that they see as the president’s political enemies and critics just to further defame, malign and humiliate us and destroy our future and careers. This is vindictive, petty and wicked and, as long as the Lord is on the throne, it will not stand. It is a very dangerous precedent and I sincerely hope that all stakeholders take note of the implications of what is brewing and going on. It would be a very dangerous thing and utterly counter-productive for this government to open a can of worms and try to implicate innocent men and women who were simply doing their job and who knew nothing about any wrong-doing or illicit and illegal transactions or bank transfers of public funds from or to government accounts. I wish to remind them that they will not be in power forever. Sooner or later the tables will turn and they themselves will be subjected to the malicious lies, false allegations, smear campaigns, injustice, brutality and persecution that they are presently subjecting others to. It is only a question of time. Now let the Ancient of Days and He who never sleeps or slumbers, the God of Abraham, Isaac and Jacob, judge between this government and all those innocent men and women that they are demonising and persecuting and that they seek to torment and destroy. As long as Jesus is on the throne and our hands are clean, no matter how long it takes, we shall prevail and ultimately they will pay a heavy price for their malice, injustice and wickedness. These are facts and readers can be rest assured that I will say nothing different to this if and when I am formally asked by anyone or any agency. When the EFCC begin to leak their falsehood and sallacious allegations to their agents in the media kindly take note of the fact that, as usual, they will be telling tall tales and they will be lying. Now I challenge them to do their worse. I have no fear of them or of those who have sent them to do this dirty job. May God judge them all and may He reward them for their wickedness. 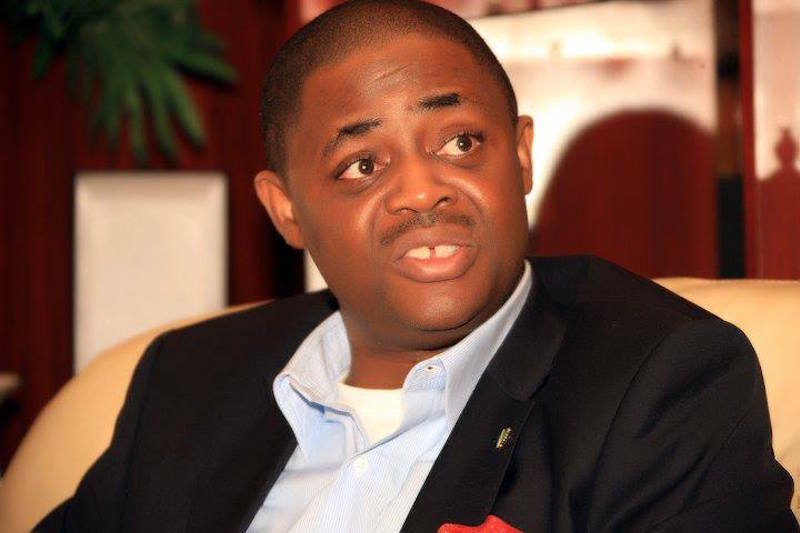 Femi Fani-Kayode, a lawyer and former Minister of Aviation, is a leading member of Nigeria’s political opposition, the Peoples Democratic Party (PDP).